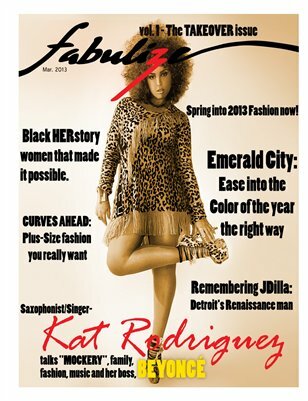 www.FabulizeMag.com debuts with Saxophone Player and singer, Kat Rodriguez who plays with superstar Beyonce. Find out more the sassy singer as she talks fashion, music and what it's like to work with Beyonce. Also discover some great beauty products for women of color that come highly recommended from your favorite bloggers. Try some new ethnic recipes, shop for the best Emerald fashion pieces, get your shoe game ready and look at some of the best plus-size spring and summer fashion.